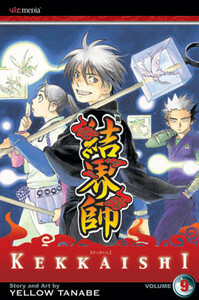 The three kekkaishi-in-arms, Tokine, Yoshimori, and Gen, are not getting along! So much so that Gen's sensei, Atora, challenges them to a task requiring real teamwork! Plus, Gen receives a strange gift from an enemy - one that may reveal something about himself that he would prefer not to know!